“Once in a while it is completely acceptable to flip your lid, so to speak. Sometimes you have to let loose of all of your self-imposed restraints. You are a being who has quite a history, indeed, quite a bit of stored information. And when that storage room gets too full, there must be a release. It is quite all right if you have a moment where you blow a gasket, so to speak. It is understandable why you would. It is not your job to be perfect, and it is not your job to fit in, and it is not your job to make sure everyone else is comfortable. So when you need to have a moment where you lose it, so to speak, do not reverse the good progress that you are making by feeling ashamed, feeling bad, being overly apologetic. Everyone has those moments. Everyone can relate and understand to the moment when you just can’t take it anymore. In some ways, this is one of the most liberating things you can do. You will feel a lightness inside you after you have this type of explosive episode because you will have let out so much of that stored information. And it is lightness that you are after, after all. 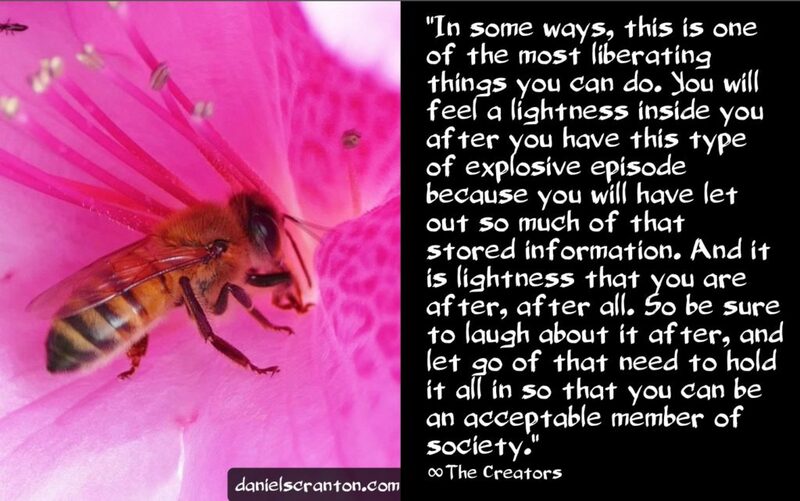 So be sure to laugh about it after, and let go of that need to hold it all in so that you can be an acceptable member of society.